A Santiago beauty, Gabriela PULGAR LUCO has been crowned Miss Mundo Chile 2011 at the Santiago Hotel, Santiago on 10th September 2011. Gabriela PULGAR will represent her country, Chile, in the Miss World 2011 in London, UK, on November 6. The last Miss Chile beauty pageant took place in 2000 and it was brought back this year by Carla Marin Tobias and Polinka Lewitt from Com-Clave Ltda. This is the first time the official Miss Chile competes in Miss World. 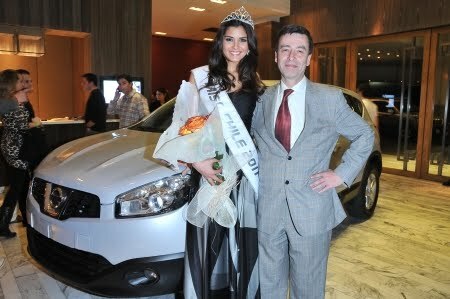 Gabriela PULGAR won a Nissan Qashqai as part of her prize package and a tour to London on Air France to attend Miss World 2011. The ten contestants from left to right are Adderly Germal, Gabriela Pulgar, Camila Schuler, Constanza Von Dessaver, Vinka Prussing, María del Pilar Aranda, Francisca Tamayo, Barbara Schenke, Francisca Camacho and María Belen Vega. AMBITIONS To be able to deliver a positive message to people with special needs and become a successful singer. PROUDEST MOMENT singing in front of her school. PERSONAL MOTTO We come to life for three things: to learn to love, to leave a mark and to be happy. Be grateful for whatever you are and have. FAVOURITE MUSIC Favourite artists are Ray Charles, Aretha Franklin, Alejandro Sanz, Caetano Veloso, Shakira and Coldplay. FAVOURITE BOOKS Favourite authors are Carlos Ruiz Zafon and Jose Romero.